Area : Its area is 200 sq km. Languages : Marathi, Hindi, English. Temperature : Max.40°C & 24°C Min in summer. Max.30°C & 14°C Min in winter. Clothing : Summer light cotton.Winter light woolen. 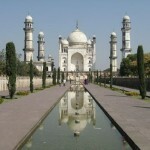 Aurangabad is a convenient base for organizing visits to the famous rock-cut temples of Ajanta & Ellora. The town is named after Aurangzeb, the last of the six great Mughal Emperors, who built a mausoleum here for his wife. Air: Aurangabad is connected by Indian Airlines flights to Mumbai, Delhi. Rail: Aurangabad is on the Manmad – Secunderabad line of south central railways. Direct broadguage trains could reach Aurangabad from Mumbai, Hyderabad. Amritsar, New Delhi, Agra Gwalior, Bhopal etc. Road: Aurangabad is well connected by good motorable road with Ajanta 106 km, Mumbai 393 km, Ellora 30 km. Bibi-Ka-Maqbara :This wonderfully constructed monument was built in the year 1679 by Aurangzeb’s son as a remembrance in the honour of his mother Begum Rabia Durani. This Monument standing as a replica of the Taj Mahal. This is an example of the beauty of the Mughal architecture.But, if the delicacy of the work etc are compared,it falls far short of the glory of Taj Mahal of Agra. 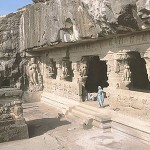 Aurangabad Caves : Aurangabad cave is a world heritage site. 7km away at the end of the city on sahyadri hill is south facing aurangabad caves.There are ten caves, divided into two separate locations – Western Group Caves having caves 1-5 and Eastern Group Caves having caves 6-10, located 1.5 km from the west. Cave No. 1 is incomplete.Cave No. 1 is incomplete.Cave No. 2 ,there is a large statue of Buddha imparting knowledge.Cave No. 3 is well decorated and supported by 12 artistic pillars.The oldest cave is cave no. 4.Cave no. 5 is ruined.In cave no. 6 has a large idol of Lord Buddha.Cave 7 is the most remarkable of all the caves in Aurangabad, for its sculptures that portray figures of women meagerly dressed and richly ornamented.The rest of the caves with very little attraction. Pan Chakki : Panchakki is a major attraction of Aurangabad. 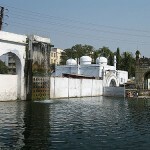 Early years of the 17th century a Muslim Sufi Saint Baba Shah Musafir built the Panchakki or the Water mill in Aurangabad.The mill used to grind grains for the pilgrims. Water through the pipes flows with a force and it rises to a huge raised masonary pillar and from there it falls to make an attractive water fall. 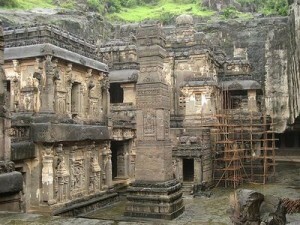 This entry was posted in Aurangabad, Maharashtra and tagged Aurangabad Caves, Aurangabad Route, Aurangabad Tourists places. Bookmark the permalink.